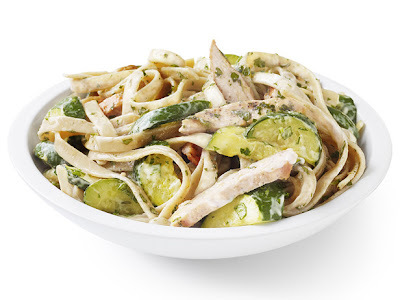 The Chicken Recipes Kitchen (The home of delicious chicken recipes) invites you to try Chicken-Zucchini Alfredo Recipe. Enjoy our collection of quick & easy recipes and learn how to make Chicken-Zucchini Alfredo. Bring a large pot of salted water to a boil. Heat 1 tablespoon olive oil in a nonstick skillet over medium heat. Add 1 clove garlic and cook 30 seconds. Add the zucchini, cover and cook until tender, stirring, about 6 minutes. Transfer to a bowl. Heat another tablespoon oil in the skillet over medium-high heat. Season the chicken with 1/4 teaspoon each salt and pepper and cook through, 2 to 3 minutes per side. Transfer to a plate. Cook the pasta in the boiling water as the label directs. Drain, reserving 1/2 cup cooking water; return the pasta to the pot. Meanwhile, whisk the flour and low-fat milk in a bowl. Place the remaining 1 clove garlic and 1 tablespoon oil in the skillet and cook over medium-high heat, 30 seconds. Add the flour-milk mixture and bring to a boil, stirring. Reduce the heat to low and cook, stirring, 2 minutes. Add the evaporated milk, 1/2 teaspoon salt and the cheese; stir to melt, 1 minute. Cut the chicken into strips. Toss with the pasta, sauce, zucchini and parsley, adding the reserved pasta water to loosen.